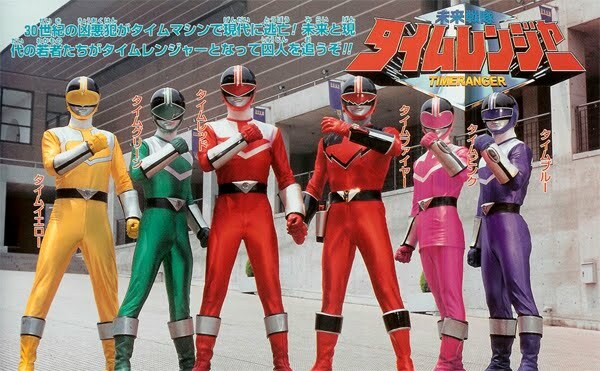 Super Hero Time and Over Time Fansubs finally releases the first episode of one of the most coolest and darkest Super Sentai series around, Mirai Sentai Timeranger. It is the 24th Super Sentai series that originally aired in 2000. In the 30th century, time travel becomes illegal after a time paradox crisis. The Time Protection Department is established to watch for and stop time crimes. Four new enlistee cadets of the TPD are tricked by Don Dolnero and his gang into letting them time-travel to the year 2000 to commit various crimes. To protect history, the four cadets pursue them. There they encounter a severe problem: the Timeranger program requires five members for the first operation. They thus force a present-day martial artist, Tatsuya Asami, to join them, allowing them to become the Timerangers. Just to clarify: this is a joint with the group Super Hero Time!, as labeled on the release name.